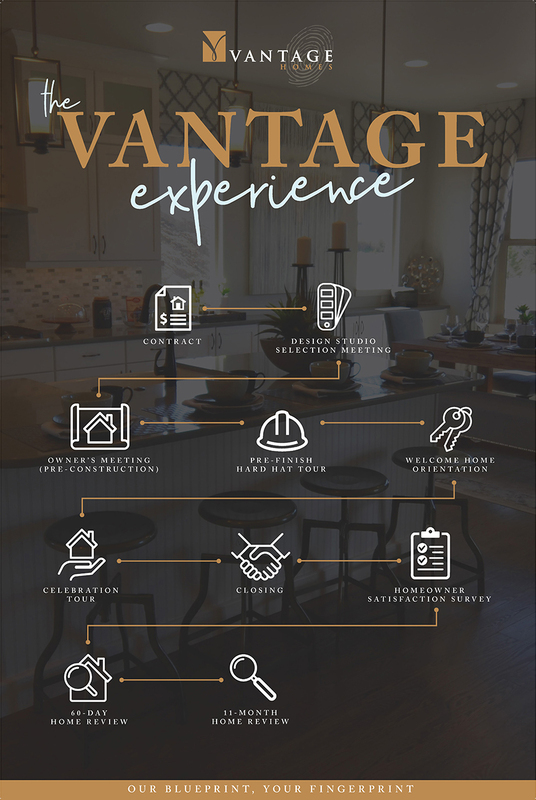 Vantage Homes has a system that keeps you in the loop at all times throughout your new home experience. We call them our nine touchpoints. Not every builder does this but we think it’s very important. You will too. Once you’ve selected your home and your options, it’s time to cross all the T’s and dot all the I’s. Then get ready for a great ride on the road to your new home. This is fun. You have virtually thousands of choices for putting those all important personal touches on your new home. You’ll love the convenience of making these selections in one location and working with a design consultant. Now you meet with the construction team and review how the process works and the key stages to expect during construction. It’s getting more exciting. Once the framing, rough-ins and mechanicals are complete, it’s time to walk through your new home. We want to show you all the behind the scenes state-of-the art systems and technology that make your home the best value available. The home is finished, you’re ready to move in. We want to give you a complete tour, show you how everything works and go over product warranties and helpful maintenance tips. You're almost there! In fact, you're just about to close on your new home. This is when your home building team gives you your final tour to make sure everything we discussed in your Welcome Home Tour has been addressed. In this step, there are so many reasons to celebrate! Now the home is really yours. Congratulations! Remember, we are a home building company that has mastered the art of listening to our clients. We do want to know what you think about your new home and the whole experience. To accomplish this, your independent survey will be mailed to you. Your first sixty days in your new home is your time to get settled and make your new house a home. Now that you've been in the home awhile, this is the time to tell us about anything that needs attention. Remember, we like to listen and your satisfaction is our goal. This is the final check before the 1-year limited warranty expires on workmanship and materials. We want to be sure you’re covered.